Summer basil isn't only for tomato and mozzarella salads. It's also great during cocktail hour! Summer basil isn't only for tomato and mozzarella salads. It's also great during cocktail hour! From sangria to martinis, here are nine amazing drinks to make with the delicious herb. Thai basil sprigs add terrific herbal flavor to this golden sangria. 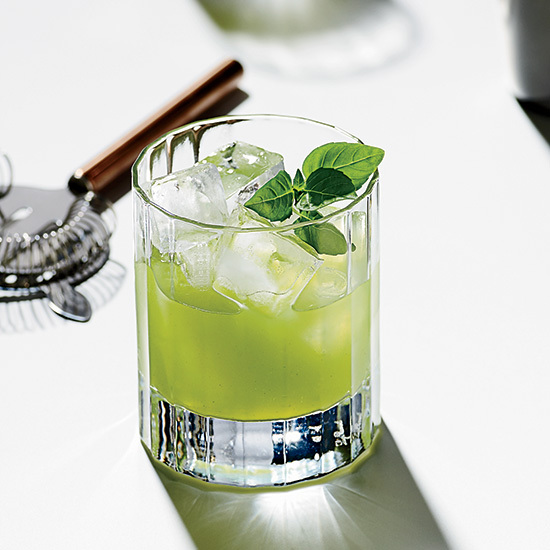 An abundance of summer basil led mixologist Todd Thrasher to create this easy, five-ingredient cocktail. Ice cubes made with yellow-tomato juice combined with Thai basil and homemade jalapeño vodka make this the ultimate summer Bloody Mary. Basil leaves are used both in a syrup and as a garnish for this fantastic rum drink. Upgrade the traditional cocktail with fresh basil and celery bitters. Sweet white vermouth highlights basil's herbal quality, while limoncello and lemon juice give this drink an amazing citrus kick. The classic Italian pairing of strawberries and balsamic vinegar inspired this sweet, tangy cocktail. Basil-cucumber purée enhances the wonderful vegetal flavor of Sotol, a mezcal relative made from an agave-like plant. Chef Laurent Tourondel's refreshing version of a martini features muddled basil and cucumber, as well as a mixture of zesty lime juice and ginger syrup.